Expert guidelines from both sides of the Atlantic have consistently recommended paracetamol, not non-steroidal anti-inflammatory drugs (NSAIDs), as the initial oral drug treatment for osteoarthritis (OA).1–5 This has been justified by the excellent safety record and low cost of paracetamol relative to NSAIDs, and the absence of any significant clinical benefit of NSAIDs over simple analgesia. However, recent data from the USA suggest that NSAIDs may be better than paracetamol for symptom relief in large joint (hip, knee) OA.6–8 These data follow shortly after an unprecedentedly high profile launch and promotion of selective inhibitors of cyclo-oxygenase 2 (coxibs). The clinical benefit of coxibs in OA is equivalent to that of traditional NSAIDs, but coxibs do not have the increased risk of severe gastrointestinal (GI) side effects (peptic ulceration, bleeding, perforation, and obstruction). In America, particularly, these events have led to an intense debate about the relative role of NSAIDs, coxibs, and paracetamol in OA management. This review deals with key questions relating to such drug prescribing for the management of OA. Is “which drug to use first” a relevant question? Although guidelines and reviews about the management of OA seem to be obsessed with this question, it probably has little relevance to clinical practice. Many patients treat themselves before consulting any doctor and have tried over the counter medicines that may include both paracetamol and NSAIDs.8 The concept of which drug to use first implies that monotherapy is the norm. However, most clinical trials of NSAIDs and coxibs allow concomitant paracetamol as “escape analgesia” and in a clinical setting a package of care is usually delivered. As rheumatologists largely see patients with OA only once and after a considerable delay, a more pertinent question for them may be “which drug, or drugs, are most appropriate and useful as the mainstay for long term symptom control in OA”. Is which drug to use an important focus for discussion of OA management? All guidelines agree that non-pharmacological measures should be central to the management plan of any patient with OA, with pharmacological agents largely regarded as adjunctive optional treatments.1–5 Such core non-pharmacological measures include patient education, weight loss if obese, local strengthening and aerobic exercise, and biomechanical measures (such as pacing of activities and appropriate footwear) to avoid excessive loading of the OA joint. There is reasonable research evidence to support such “lifestyle” changes,1–6,9 all of which are safe, have excellent face validity, increase self efficacy, and may avoid, or reduce, the requirement for drug treatment. Unfortunately, undue emphasis on short term symptomatic tablets such as NSAIDs and coxibs may deflect attention from these more important long term measures, many of which may already be underused in patient management. Important though coxibs and NSAIDs may be from the perspective of the pharmaceutical industry, a prestigious document that focuses more than 25% of its text on the choice between paracetamol, NSAIDs, and coxibs6 is arguably giving the wrong message about global patient management. Is paracetamol effective for OA? Although paracetamol is widely recommended and used, research evidence for this is surprisingly scant. There has been only one placebo controlled trial of paracetamol in OA. Although it included just 25 patients with knee OA, it showed the greater efficacy of paracetamol.10 Studies comparing NSAIDs with paracetamol in OA support its efficacy,7,11,12 though these studies have omitted comparison with placebo. Paracetamol affords reasonable analgesia for postoperative acute pain, with a number needed to treat (NNT) of 4.6 for at least 50% pain relief compared with placebo.13 Although such efficacy cannot necessarily be extrapolated to the chronic pain associated with OA, the short term analgesic potential of paracetamol is well accepted. Are NSAIDs more effective than paracetamol for OA? However, despite this reported statistical superiority of NSAIDs over paracetamol, two recent surveys have shown that more than 40% of patients with OA either prefer paracetamol rather than NSAIDs, or find no difference between the two8,15 (fig 1). Furthermore, the proportion of those expressing preference for paracetamol increased with age.15 Interestingly, the American authors of these studies interpreted the results as strongly favouring NSAID (a case of the glass half empty or half full). However, the absence of a clear perceived benefit from NSAID in many patients with OA (almost half in these studies) argues against any policy to by-pass paracetamol on the basis of superior efficacy. Coxibs have been shown to have efficacy in OA that is better than placebo and comparable with that of conventional NSAIDs.16,17 One recent six week study comparing rofecoxib (25 mg or 12.5 mg daily), celecoxib (200 mg/day), and acetaminophen (4 g/day) in 382 patients with knee OA has reported better efficacy for relief of pain during walking, rest pain, night pain, and morning stiffness in those taking 25 mg rofecoxib, with both coxibs appearing stronger than acetaminophen.17a At six weeks a good or excellent response was reported by 4/10 patients taking paracetamol, 5/10 taking celecoxib, and 6/10 taking rofecoxib—a statistically significant but not over impressive clinical difference. The common caveats, discussed below, of short term treatment, the inclusion requirement of a “flare” after withdrawal of pre-study analgesia, and exclusion of patients with significant comorbidity all apply to this study. 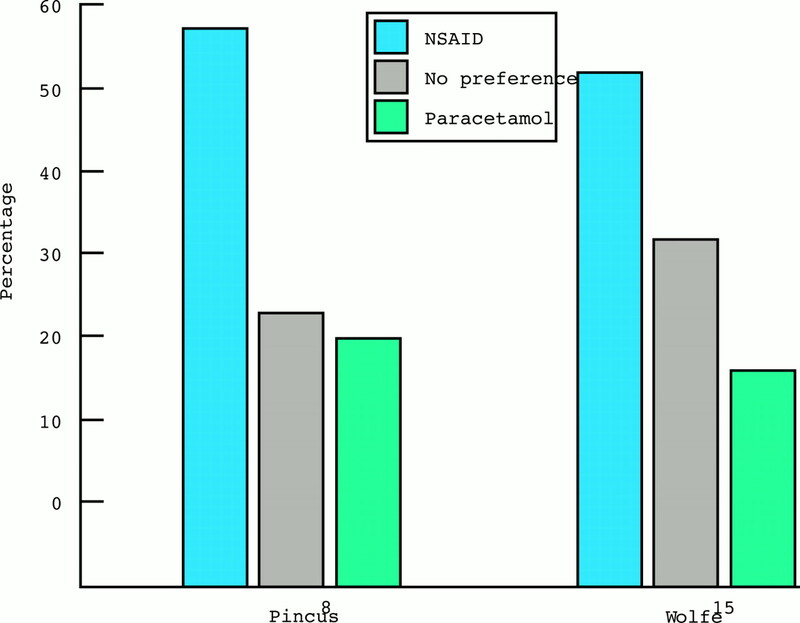 Histogram showing patient preference for NSAIDs or paracetamol for OA (adapted from Pincus et al8 and Wolfe et al15). Both studies show that over 40% of patients either prefer paracetamol or did not express a preference. What magnitude of benefit can be expected from NSAIDs and can we predict which patients will obtain additional benefit from oral NSAIDs relative to paracetamol? The magnitude of benefit from NSAIDs in OA is usually modest with visual analogue scales typically improving by about 20 mm on a scale of 0–100.18 Although large studies may show statistically significant group benefits, the individual gains are often trivial. Are there issues concerning the design of clinical trials of NSAIDs in OA? In contrast with the paucity of randomised controlled trials of paracetamol, over half of all clinical trials in knee OA relate to NSAIDs.1,22 This primarily reflects the investment and marketing requirements of the pharmaceutical industry.22 Certain caveats that are common to these studies deserve emphasis. For example, most controlled trials of NSAIDs are short term with a median duration of just six weeks (fig 2), though longer trials of coxibs are in progress. Also, a recent strategy that has become popular, if not universal in industry sponsored studies, is to restrict recruitment to patients who demonstrate a “flare” (increase in pain) when their current analgesics, largely NSAIDs, are withdrawn. This, of course, results in selection bias towards patients who respond to oral drugs and reduces the generalisability of the results. Multiple additional exclusion criteria produce a homogeneous but unrepresentative study group that prevents examination of clinical predictors of response (for example, knee effusion, degree of radiographic change). Furthermore, paracetamol is often allowed as “rescue analgesia” to reduce drop-out rates, but the combined efficacy of NSAID and paracetamol is not specifically analysed. One trial that dealt with this issue23 showed that the efficacy of low dose naproxen plus paracetamol is comparable with that of high dose naproxen—in other words paracetamol had an “NSAID sparing” effect. However, whether higher dose NSAID plus paracetamol is better than either drug alone for more severe pain in OA has not been examined. Factorial study designs could efficiently address this issue. 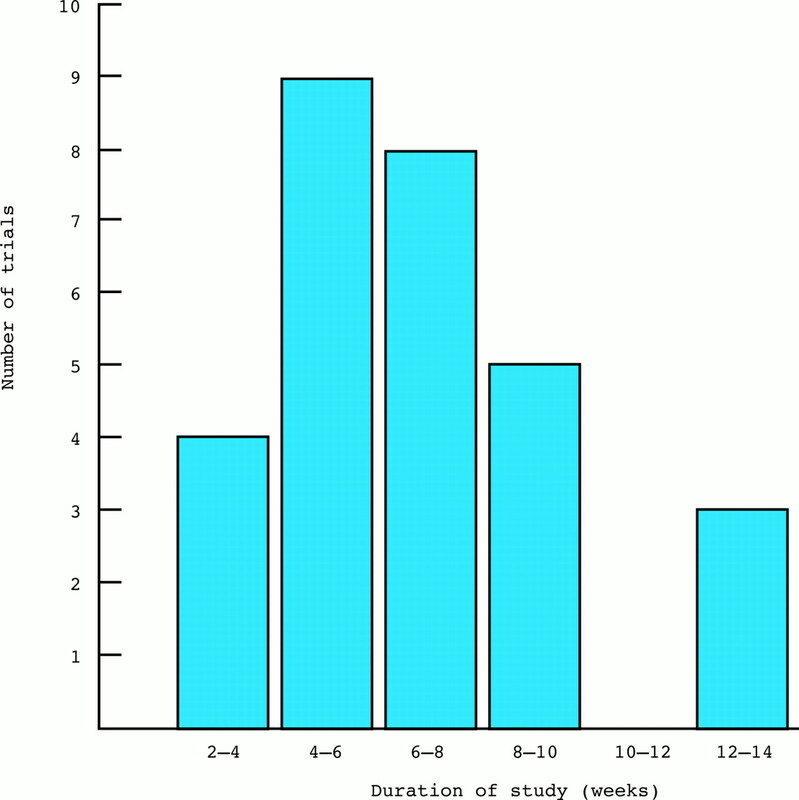 Histogram showing the duration of 29 randomised controlled trials of oral NSAIDs for OA (reproduced with permission from www.eBandolier). Why are long term results particularly important? OA is usually treated for years not weeks, so a long term perspective is clearly important when efficacy data are being considered. Unfortunately, in clinical practice the rate of NSAID discontinuation in patients with OA is high (fig 3), with only 10–15% of patients still taking their NSAID after 12 months.24 This reflects the patients' perspective of the usefulness of NSAIDs, taking into account the balance of efficacy and side effects.24 Even in the artificial setting of a clinical trial, two thirds of patients have discontinued treatment with oral NSAID or paracetamol by two years.11 Although it is suggested that NSAIDs more commonly are discontinued because of side effects and paracetamol because of perceived lack of efficacy,8,24 it is clear that the long term usefulness of both agents is less impressive than the short term data imply. Graph showing discontinuation rates of four oral NSAIDs over a 12 month period (reproduced with permission from Scholes et al24). ASA-EC, enteric coated aspirin. The evidence implicating NSAIDs as a risk factor for radiographic progression in human OA is not without its caveats and requires confirmation.29 Nevertheless, no such concerns have been expressed for paracetamol, though clinical trials to establish its safety in this respect have not been undertaken. Are topical NSAIDs a safe and effective alternative to oral treatment? 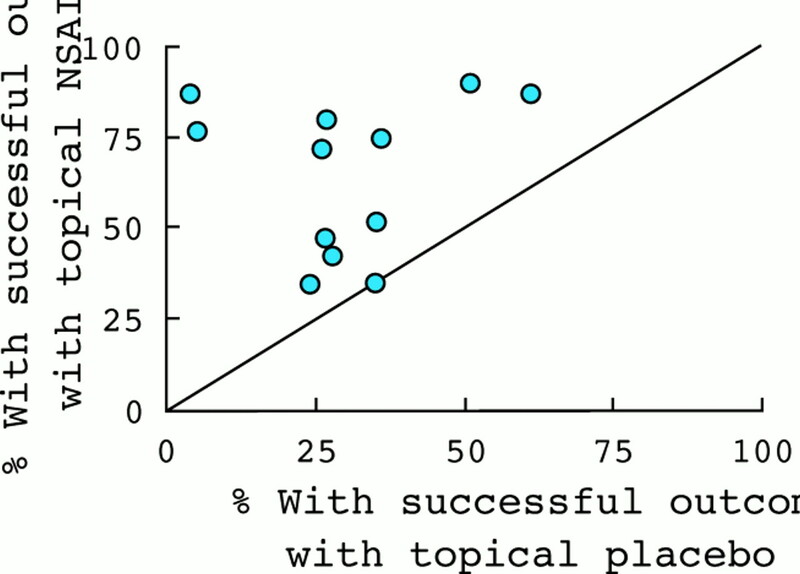 L'Abbé plot showing percentage of patients that achieved at least 50% pain relief from topical NSAIDs or placebo in 12 OA trials (reproduced with permission from www.eBandolier). It is evident that all trials favour the active treatment. Is paracetamol safer than conventional non-selective NSAIDs? 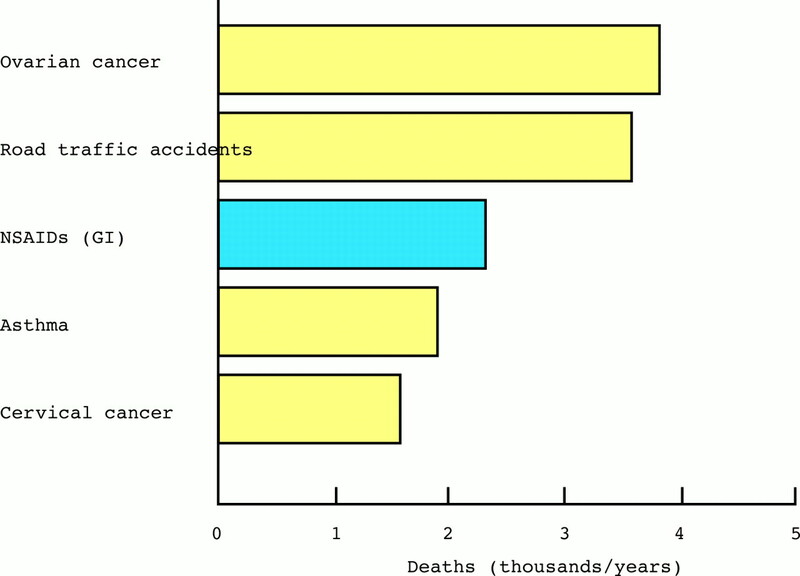 Gastrointestinal mortality associated with NSAIDs37 compared with other causes of death in the United Kingdom (Office for National Statistics 1997). Are there significant safety concerns with paracetamol? Paracetamol is thought to work mainly through inhibition of central cyclo-oxygenase (COX) with only very weak effects on peripheral prostaglandin synthesis.45 However, there have been recent reports of two new possible adverse effects that might relate to peripheral COX inhibition. Firstly, one UK case-control study suggested that frequent (weekly or daily) paracetamol may be associated with asthma and rhinitis46 (discussed below). Secondly, and perhaps more importantly, a record linkage study using an automated UK database suggested that paracetamol has dose dependent GI toxicity.47 However, these data were generated as a by-product of a study examining the safety of newer NSAIDs in which paucity of data prevented conclusions. They may be confounded by inability to account fully for concomitant drug usage and are counter to other epidemiological evidence that shows no GI risk from paracetamol.48 Furthermore, although paracetamol has an additive effect on ibuprofen-induced gastric erosions in rats,49 it has not been shown to cause gastroduodenal injury in human trials.50 Nevertheless, despite the balance of evidence supporting no significant GI toxicity from paracetamol further studies to specifically deal with this issue are underway. Are concerns about NSAID associated GI toxicity eliminated by coxibs or combination with gastroprotective agents? Nevertheless, despite their reported safety, less serious dyspepsia may still occur with coxibs and this might have an impact on quality of life and costs due to additional doctor visits and investigations. A direct comparison of the incidence of troublesome non-specific GI side effects from coxibs, conventional NSAIDs, paracetamol, and placebo has not been reported in the same population. Are COX-2 specific inhibitors as safe as paracetamol? Paracetamol and coxibs have not been directly compared in clinical trials. In patients with renal impairment, paracetamol is the preferred analgesic,44 but there are concerns about coxibs, perhaps more with rofecoxib than celecoxib.56 Paracetamol has only one drug interaction, with high dose warfarin,57 but NSAIDs and coxibs have multiple drug interactions.58 The only safety factor in favour of coxibs is that they appear to be relatively safe at supratherapeutic (though not necessarily “overdose”) levels, whereas paracetamol is potentially fatal in overdose. Which drug is preferred in patients with OA and asthma? Non-selective NSAIDs are associated with serious drug induced bronchospasm (aspirin-induced asthma).59 The likely mechanism is COX inhibition, diverting arachidonic acid metabolites to the lipoxygenase pathway with a resultant increase in leucotriene synthesis.60 There is accumulating evidence that rofecoxib does not induce bronchospasm in patients with documented aspirin-induced asthma.60,61 Paracetamol has not been linked to acute bronchospasm. However, one case-control study reported a graded association between paracetamol and asthma with daily users of paracetamol having an odds ratio for asthma of 2.38 (95%CI 1.22 to 4.64) compared with never users.46 There are caveats to such a case-control study, including the fact that self reported drug use was current rather than retrospective (premorbid), though the authors did not think that avoidance by patients with asthma of aspirin and NSAIDs in favour of paracetamol explained this association. Although weak inhibition of COX-1 and COX-2 by paracetamol45 and reduction of lung glutathione antioxidant levels46 might theoretically predispose to asthma, a causal link first needs to be established, ideally in a prospective study. Is the absence of an antiplatelet effect with coxibs an advantage in patients with OA? The absence of antiplatelet activity (resulting from COX-1 inhibition) with coxibs was initially considered advantageous because it might further reduce the risk of GI bleeding and allow coxibs to be used more safely with anticoagulants.62 However, this antiplatelet effect might be advantageous in patients with OA who predominantly are elderly with frequent comorbidity such as obesity and thus often at higher risk of cerebrovascular or ischaemic heart disease. This indeed is supported by the increased rate of myocardial infarction seen with selective COX-2 inhibition (rofecoxib) compared with non-selective COX inhibition (naproxen).50,63 Paracetamol has no significant effects on platelets so this issue only relates to comparisons between coxibs and NSAIDs. Management must be individualised and patient-centred. Debate about NSAIDs and coxibs should not distract attention from the more important non-pharmacological interventions that are central to any long term management plan. Paracetamol and NSAIDs are evidence based drugs for symptom relief in OA, but benefits are often modest and long term adherence is poor. Coxibs have only equal (not better) efficacy to non-selective NSAIDs. NSAIDs give more pain relief to some patients with OA, but others (almost half those studied) find paracetamol either better than NSAIDs or equally effective. There are no recognised clinical predictors of response to NSAIDs or paracetamol. Advice alone, with or without simple non-drug measures or over the counter drugs, allows many chronic NSAID users to stop their NSAID without a problem. Common caveats to NSAID/coxib trials in OA (for example, selection bias, short term outcomes, non-attributed escape analgesia) reduce the generalisability of the results. Topical NSAIDs are effective, popular with patients, and probably underused. Many patients with OA are elderly and have comorbid disease. They are often at highest risk of NSAID associated side effects (GI, renal, cardiovascular) and drug interactions. Paracetamol at therapeutic doses has an excellent safety record compared with oral NSAIDs and coxibs. Paracetamol is the preferred analgesic in patients with renal impairment, chronic liver disease, hypertension, chronic heart failure, or aspirin-induced asthma. The use of coxibs, or NSAIDs plus gastroprotection, greatly reduces morbidity/mortality from GI toxicity. Topical NSAIDs are very safe and have no GI toxicity. The antiplatelet activity (COX-1 inhibition) associated with non-selective NSAIDs may result in less cardiovascular mortality with NSAIDs than with coxibs. Paracetamol is very much cheaper than NSAIDs and coxibs. Which drugs are most cost effective? What factors influence analgesic prescribing for individual patients with OA? The patient's perceptions and knowledge of OA and its treatment. The patient's perspective is crucial to any success or adherence to treatment. Patients often perceive paracetamol to be either too mild, because of its availability, or too dangerous, because of its toxicity in overdose, and worry that benefits diminish with regular use. They may believe that treatment has “failed” with paracetamol after taking only a suboptimal dose or frequency. Such perceptions require open and full discussion. Equally, the potential benefits and side effects of NSAIDs, coxibs, or other agents require full discussion before a trial of such treatment is mutually agreed. Common sense dictates that simple and safe interventions are tried first before more complex, expensive, or potentially dangerous interventions. A step-up, additive approach is most usual for control of chronic pain. The patient's symptoms and requirements will alter with time and in response to treatment, requiring review and re-adjustment rather than rigid continuation of a single algorithm. Paracetamol, topical NSAID, and either oral non-selective NSAIDs or coxibs may all legitimately be used singly or in combination in individual patients. However, from the issues discussed above, it would seem irrational if paracetamol were not given an appropriate trial before oral NSAIDs or coxibs. If good benefit is obtained paracetamol should remain the principal oral treatment.1 If definite, but insufficient relief is obtained other oral or topical agents may be tried in addition. If paracetamol or any drug gives no relief it should be abandoned and other options tried. Can NSAID prescribing be reduced in OA? The addition of topical NSAIDs, coxibs, or traditional NSAIDs (and other pharmacological agents) should be considered, depending on the response to paracetamol (and other interventions) and on individual patient factors. Pendleton A, Arden N, Dougados D, Doherty M, Bannwarth B, Bijlsma JWJ, et al. EULAR recommendations for the management of knee osteoarthritis: report of a task force of the Standing Committee for International Clinical Studies Including Therapeutic Trials (ESCISIT). Ann Rheum Dis2000;59:936–44. Walker-Bone K, Javaid K, Arden N, Cooper C. Medical management of osteoarthritis. BMJ2000;321:936–40. Hochberg MC, Altman RD, Brandt KD, Clark BM, Dieppe PA, Griffen MR, et al. Guidelines for the medical management of osteoarthritis. Part I. Osteoarthritis of the hip. Arthritis Rheum1995;38:1535–40. Hochberg MC, Altman RD, Brandt KD, Clark BM, Dieppe PA, Griffen MR, et al. Guidelines for the medical management of osteoarthritis. Part II. Osteoarthritis of the knee. American College of Rheumatology. Arthritis Rheum1995;38:1541–6. American College of Rheumatology Subcommittee on Osteoarthritis Guidelines. Recommendations for the medical management of osteoarthritis of the hip and knee: 2000 update. Arthritis Rheum2000;43:1905–15. Pincus T, Koch GG, Sokka T, Lefkowith J, Wolfe F, Jordan JM, et al. A randomized, double-blind, crossover clinical trial of diclofenac plus misoprostol versus acetaminophen in patients with osteoarthritis of the hip or knee. Arthritis Rheum2001;14:1587–98. Pincus T, Swearingen C, Cummins P, Callahan LF. Preference for nonsteroidal antiinflammatory drugs versus acetaminophen and concomitant use of both types of drugs in patients with osteoarthritis. J Rheumatol2000;27:1020–7. Felson DT (chair). Osteoarthritis: new insights. Ann Intern Med2000;133:726–7. Amadio P, Cummings DM. Evaluation of acetaminophen in the management of osteoarthritis of the knee. Curr Ther Res1983;34:59–66. Moore A, Collins S, Carroll D, McQuay H. Paracetamol with and without codeine in acute pain: a quantitative systematic review. Pain1997;70:193–201. Felson DT. The verdict favours nonsteroidal antiinflammatory drugs for treatment of osteoarthritis and a plea for more evidence on other treatments. Arthritis Rheum2001;44:1477–80. Wolfe F, Zhao S, Lane N. Preference for nonsteroidal antiinflammatory drugs over acetaminophen by rheumatic disease patients. Arthritis Rheum2000;43:378–85. Ehrlich EW, Schnitzer TJ, McIlwaine H, Levy R, Wolfe F, Weisman M, et al. Effect of specific COX-2 inhibition in osteoarthritis of the knee: a 6 week double blind, placebo controlled pilot study of rofecoxib. J Rheumatol1999;26:2438–47. Bensen WG, Fiechtner JJ, McMillen JI, Zhao WW, Yu SS, Woods EM, et al. Treatment of osteoarthritis with celecoxib, a cyclooxygenase-2 inhibitor: a randomised controlled trial. Mayo Clin Proc1999;74:1095–105. Geba P, Weaver AL, Polis AB, Dixon ME, Schnitzer TJ. Efficacy of rofecoxib, celecoxib and acetaminophen in osteoarthritis of the knee. JAMA2002;287:64–71. Tyson VCH, Glynne A. A comparative study of benoxaprofen and ibuprofen in osteoarthritis in general practice. J Rheumatol1980;7(suppl 6):132–8. Brandt KD. A critique of the 2000 update of the American College of Rheumatology recommendations for management of hip and knee osteoarthritis. Arthritis Rheum2001;44:2451–5. Brandt KD, Bradley JD. Should the initial drug used to treat osteoarthritis pain be a nonsteroidal antiinflammatory drug? J Rheumatol2001;28:467–73. Chard JA, Tallon DJ, Dieppe PA. Epidemiology of research into interventions for the treatment of osteoarthritis of the knee joint. Ann Rheum Dis2000;59:414–18. Seideman P, Samuelson P, Neander G. Naproxen and paracetamol compared with naproxen only in coxarthrosis: increased effect of the combination in 18 patients. Acta Orthop Scand1993;64:285–8. Scholes D, Stergachis A, Penna PM, Normand EH, Hansten PD. Nonsteroidal anti-inflammatory drug discontinuation in patients with osteoarthritis. J Rheumatol1995;22:708–12. Brandt KD. Effects of nonsteroidal anti-inflammatory drugs on chondrocyte metabolism in vitro and in vivo. Am J Med1987;83:29–34. Rashad S, Revell P, Hemingway A, Low F, Rainsford K, Walker F. Effect of non-steroidal anti-inflammatory drugs on the course of osteoarthritis. Lancet1989;ii:519–22. Huskisson EC, Berry H, Gishen P, Jubb RW, Whitehead J. Effects of anti-inflammatory drugs on the progression of osteoarthritis of the knee. J Rheumatol1995;22:1941–6. Neal BC, Rodgers A, Clark T, Gray H, Reid IR, Dunn L, et al. A systematic survey of 13 randomized trials of non-steroidal antiinflammatory drugs for the prevention of heterotopic bone formation after major hip surgery. Acta Orthop Scand2000;71:122–8. Doherty M, Jones A. Indomethacin hastens large joint osteoarthritis in humans—how strong is the evidence? J Rheumatol1995;22:2013–16. Evans JMM, McMahon AD, McGilchrist MM, White G, Murray FE, McDevitt DG, et al. Topical non-steroidal anti-inflammatory drugs and admission to hospital for upper gastrointestinal bleeding and perforation: a record linkage case-control study. BMJ1995;311:22–6. Moore RA, Tramer MR, Carroll D, Wiffen PJ, McQuay HJ. Quantitative systematic review of topically applied non-steroidal anti-inflammatory drugs. BMJ1998;316:333–8. Dickson DJ. A double-blind evaluation of topical piroxicam gel with oral ibuprofen in osteoarthritis of the knee. Curr Ther Res1991;49:199–207. Browning RC, Johnson K. Reducing the dose of oral NSAIDs by use of feldene gel: an open study in elderly patients with osteoarthritis. Adv Ther1994;11:198–207. Wolfe MM, Lichtenstein DR, Singh G. Gastrointestinal toxicity of nonsteroidal antiinflammatory drugs. N Engl J Med1999;340:1888–99. Tramer MR, Moore RA, Reynolds DJ, McQuay HJ. Quantitative estimation of rare adverse events which follow biological progression:a new model applied to chronic NSAID use. Pain2000;85:169–82. Page J, Henry D. Consumption of NSAIDs and the development of congestive heart failure in elderly patients. An under recognised public health problem. Archiv Intern Med2000;160:777–84. Sandler DP, Burr FR, Weinburg CR. Nonsteroidal anti-inflammatory drugs and risk of chronic renal disease. Ann Intern Med1991;115:165–72. Clissold SP. Paracetamol and phenacetin. Drugs1986;32:46–59. Whitcomb DC, Block GD. Association of acetaminophen hepatotoxicity with fasting and ethanol use. JAMA1994;273:1845–50. Lynch JM, Fox TM. Use of acetaminophen in the treatment of osteoarthritis in patients with liver disease: comment on the 2000 update of the ACR recommendations for management of hip and knee osteoarthritis. Arthritis Rheum2001;44:2448–60. Sandler DP, Burr FR, Weinburg CR. Analgesic use and chronic renal disease. N Engl J Med1989;320:1238–43. Henrich WL, Agodaoa LE, Barrett B. Analgesics and the kidney: summary and recommendations to the Scientific Advisory Board of the National Kidney Foundation. Am J Kidney Dis1996;27:162–5. Warner TD, Giuliano F, Vojnovic I, Bukasa A, Mitchell JA, Vane JR, et al. Non steroid drug selectivities for cyclooxygenase-1 rather than cyclooxygenase-2 are associated with human gastrointestinal toxicity: a full in vitro analysis. Proc Natl Acad Sci USA1999;96:7563–8. Shaheen SO, Sterne JAC, Songhurst CE, Burney PG. Frequent paracetamol use and asthma in adults. Thorax2000;55:266–70. Langman MJS, Weil J, Wainwright P, Lawson DH, Rawlins MD, Logan RFA, et al. Risks of bleeding peptic ulcer associated with individual non-steroidal anti-inflammatory drugs. Lancet1994;343:1075–8. Bhattacharya SK, Goel RK, Bhattacharya SK, Tandon R. Potentiation of gastric toxicity of ibuprofen by paracetamol rat. J Pharm Pharmacol1991;43:520–1. Lanza FL, Codispoti JR, Nelson EB. An endoscopic comparison of gastroduodenal injury with over the counter doses of ketoprofen and acetaminophen. Am J Gastroenterol1998;93:1020–2. Silverstein FE, Faich G, Goldstein JL, Simon LS, Pincus T, Whelton A, et al. Gastrointestinal toxicity with celecoxib versus nonsteroidal anti-inflammatory drugs for osteoarthritis and rheumatoid arthritis. JAMA2000;284:1247–55. Hrachovec JB. 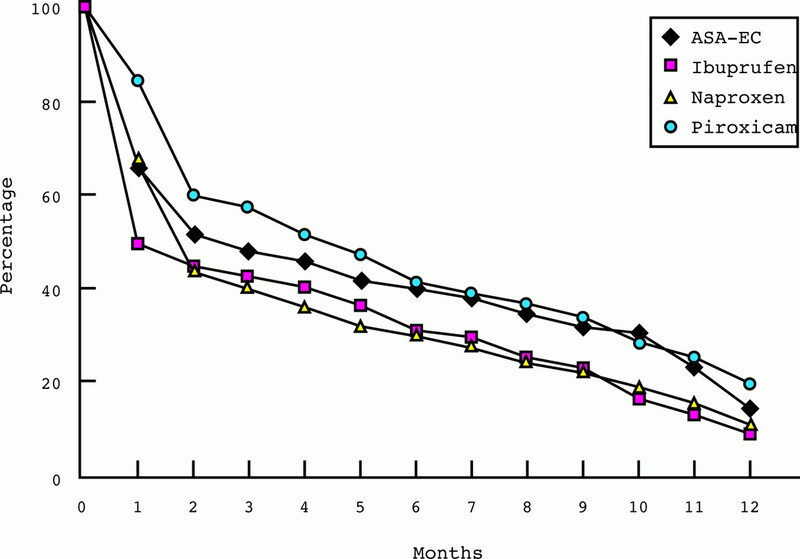 Reporting of 6-month vs 12 month data in a clinical trial of celecoxib. JAMA2001;286:2398. Silverstein FE, Graham DY, Senior JR, Davies HW, Struthers BJ, Bittman RM, et al. Misoprostol reduces serious gastrointestinal complications in patients with rheumatoid arthritis receiving non steroidal anti-inflammatory drugs. A randomized, double-blind, placebo-controlled trial. Ann Intern Med1995;123:241–9. Yeomans ND, Tulassay Z, Juhasz L, Racz I, Howard JM, van Rensburg CJ, et al. A comparison of omeprazole with ranitidine for ulcers associated with non-steroidal anti-inflammatory drugs. N Engl J Med1998;338:719–26. Whelton A, Fort JG, Puma JA, Normandin D, Bello AE, Verburg KM. Cyclooxygenase-2- specific inhibitors and cardiorenal function: a randomized, controlled trial of celecoxib and rofecoxib in older hypertensive osteoarthritis patients. Am J Ther2001;8:85–95. Hylek M, Heiman H, Skates SJ, Sheehan MA, Singer DE. Acetaminophen and other risk factors for excessive warfarin anticoagulation. JAMA1998;279:657–62. Garnett WR. Clinical implications of drug interactions with coxibs. Pharmacotherapy2001;21:1223–32. Leuppi JD, Schnyder P, Hartmann K, Reinhart WH, Kuhn M. Drug-induced bronchospasm. Respiration2001;68:345–51. Stevenson DD, Simon RA. Lack of cross-reactivity between rofecoxib and aspirin in aspirin-sensitive patients with asthma. J Allergy Clin Immunol2001;108:47–51. Szezeklik A, Nizankowska E, Bochenek G, Nagraba K, Mejza F, Swierczynska M. Safety of a specific COX-2 inhibitor in aspirin-induced asthma. Clin Exp Allergy2001;31:179–81. Karim A, Tolbert D, Piergies A, Hubbard RC, Harper K, Wallemark CB, et al. Celecoxib does not significantly alter the pharmacokinetics or the hypoprothrombinemic effect of warfarin in healthy subjects. J Clin Pharmacol2000;40:655–63. Mukherjee D, Nissen SE, Topol EJ. Risk of cardiovascular events associated with selective COX-2 inhibitors. JAMA2001;286:954–9. Peloso PM, Scheiman JM. The economic implications of cyclooxygenase-2-specific inhibitors. Am J Med2001;110:50–4S. Black D, Tuppen J, Heller A. NSAID withdrawal in elderly patients. J Am Geriatr Soc1991;39:52. Jones AC, Berman P, Doherty M. Non-steroidal anti-inflammatory drug usage and requirement in elderly acute hospital admissions. Br J Rheumatol1992;31:45–8. Keys J, Beardon PH, Lau C, Lang CC, McDevitti DG. General practioners use of non-steroidal anti-inflammatory drugs in Tayside and five regions. J Soc Med1992;85:422–5. Jones AC, Coulson L, Muir K, Tolley K, Lophatananon A, Everitt L, et al. A nurse-delivered advice intervention can reduce chronic non-steroidal anti-inflammatory drug use in general practice: a randomised controlled trial. Rheumatology (Oxford)2002;40:14–21. March L, Irwig L, Schwarz J, Simpson J, Chock C, Brooks P. N of 1 trials comparing a non-steroidal anti-inflammatory drug with paracetamol in osteoarthritis. BMJ1994;309:1041–6.